GCW Resources / Products / What Is Silestone and is it available in Atlanta? What Is Silestone and is it available in Atlanta? 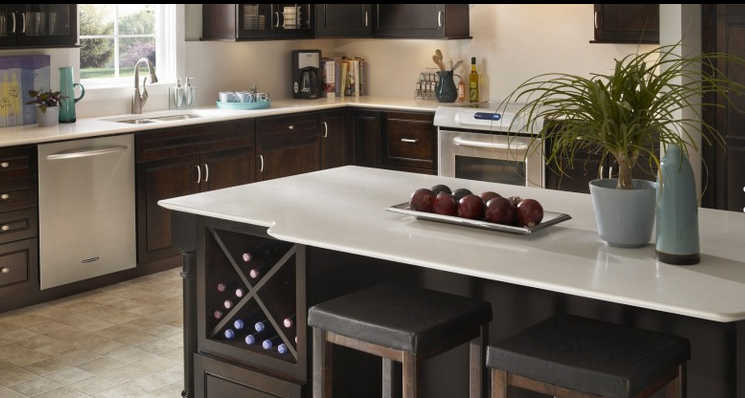 Silestone is a compound made up of 94% natural quartz, which make it extraordinarily hard and resilient. This is the one and only countertop made of quartz with anti-bacterial protection, giving it hygienic properties that are not to be found anywhere else on the market. It is an excellent surface for kitchen worktops, bathrooms, floors and wall cladding using the minimum number of joints. In addition, it comes in a variety of different shades of quartz color, offering a number of decorative possibilities from a mere kitchen top to a project for a complete set of furniture. This is a beautiful kitchen using the Yukon Blanco Silestone color. Please note how the gloss of the countertops bring out the brown of the cabinets and the color of the accessories. The white countertops bring light into the room and make everything fit together nicely. Quartz is crystallised silicon dioxide (SiO2), which is usually white or transparent, although it can be found in other colors if it comes into contact with impurities during its formation. It is found either in a pure state or present in other compounds. However, because of its extreme hardness and resistance to acids, it is used to make a large variety of products that require precision and top-quality performance. This type of quartz forms the main component in Silestone boards.